Grani brought gold from the moor Sigurd hews his sword in anger. Sigurd slayed the serpent Grani brought gold from the moor. All cultures contain echoes of mythical cultural events - some kind of archetypal reflection of our ancestors' imagination - their culture, ideals, beliefs and attempts to explain the coherence of the Universe, both the spiritual and the tangible level. One of these recurring cultural events in European culture is the vision of the mythical dragon slayer. He appears in many shapes and under different names, but the essence of the stories is the cultural hero who, despite poor odds, kills the great dragon or serpent in the mythical landscape. In Faroese culture, we find the dragon slayer in the large and ancient ballad known as the "Sjúrðarkvæði". The strain in the song actually consists of three poems, called "tættir": the first and oldest is "Regin Smiður" (Regin the Blacksmith), the next is called "Brynhildar táttur" (Brynhild's ballad), which was issued on four stamps some years ago - and third is "Høgna táttur" (Høgni's ballad). 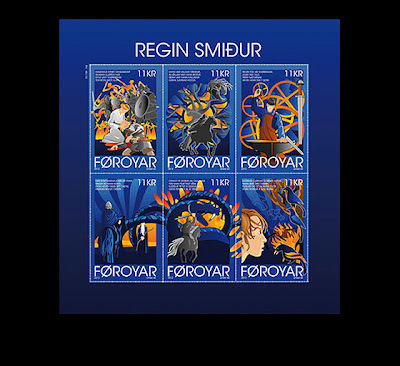 The plot of Regin Smiður is, briefly told: Sigmund Vølsungson sets out with others to war against "Hunding's sons" (the Huns). In a major battle on the shores of an unknown lake, Sigmund and his companions are beaten and none of them comes back alive. Hjørdis, Sigmund's young wife, is surprised that he does not return and goes out to look for him. She finds him on the battlefield, deadly wounded, but before he dies, he tells Hjørdis that she carries a boy-child under her belt, who shall avenge his death. He gives Hjørdis his broken sword and tells her about Regin the Smith, who can repair it, and about the great serpent Frænir, who resides out on Glitra-heath. When Sigmund is dead and buried, Hjørdis marries King Hjalprek - and nine months later she gives birth to a healthy boy whom she calls Sjúrður (Sigurd). Sigurd grows up in Hjálprek’s realm and becomes a strong and healthy young man, but has troubles controlling his immense strength and anger. One day when he accidently injures and kills some of his mates at weapons training, the warriors blame him for his violence and say that he should rather avenge his father than harming them. Sigurd goes to his mother and asks her who killed his father. She gives him Sigmund's broken sword and tells him about Hunding's sons - about Regin the Blacksmith and Frænir the serpent. On his mother's advice Sigurd goes to a river where horses graze along the bank. He throws a stone into the water to scare them, and then chooses the horse that doesn't run. This was Grani (the grey one), a great and powerful horse, who becomes Sigurd's riding horse. An early morning Sigurd rides out to find Regin at the river bank. He brings the broken sword and asks the smith to forge the blade again. Regin puts the blade in the fire for ten nights and forges it again. But when Sigurd tests its strength by striking it into the anvil, it breaks into pieces again. Sigurd becomes furious and threatens to beat Regin to death if the sword is not forged so well that it goes through steel and stone. But Regin makes the condition that he shall have the heart of the serpent when Sigurd has killed it. Then Regin puts the blade into the fire for 30 days, and when Sigurd then tests it again, it goes through both anvil and foundation without any problems. Then Sigurd is satisfied and calls the sword Gram. Sigurd then rides out to avenge his father's death. He kills all Hunding's sons and then prepares to ride out on the Glitra-heath and fight the great serpent. On the way out on the heath, Sigurd and Regin meet an old one-eyed man, Odin, who warns Sigurd against Regin's intentions. Regin will betray Sigurd, he says, but Sigurd is not inclined to listen. Out on the Glitra-heath the serpent is leaving its golden lair. It is enormous, but that does not deter young Sigurd. He sits on Grani’s back and charges Frænir - and in a violent blow with Gram, he cuts the serpent in two pieces. Before Frænir dies he tells Sigurd that Regin is his brother and that he will betray him at the first opportunity. When the serpent is dead, Sigurd places its heart on a stake and starts to cook it for Regin. When it has cooked for some time, he pokes it to feel if it is tender enough. But he burns the fingers, and when he sticks them in his mouth to cool them off, he accidently swallows some of the juice from the roast. Then he suddenly becomes alwise, and understands the language of birds and other animals. The birds repeat the warning against Regin and say that Sigurd should kill him and eat the roast himself. Then Sigurd realizes the truth - that the real treasure is the serpent’s blood and heart. He goes to Regin, who is on his knees licking the serpent’s blood, and beheads the deceitful blacksmith. Then he loads the serpent’s gold Grani’s back, and together they ride home to King Hjálprek’s realm.